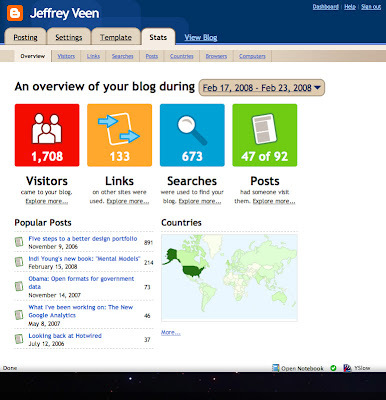 Several weeks back at South by Southwest, Jeff Veen announced our new Google Analytics for Blogger reporting interface. Currently available only in private beta, this product is a collaboration of several teams and marks the transition of Measure Map customers to a new Google Analytics interface designed specifically for Blogger users. "Many of you may remember when Google acquired Measure Map, our analytics product for blogs. When we came to Google, our first job was to take the experience of providing clear, accessible reports, coupled with powerful tools for analysis, and apply it to Google's already robust Analytics product. The result of that collaboration launched last May, in the redesigned Google Analytics interface. Since then the team has been hard at work fulfilling our original promise: to help bloggers understand the impact that their blogs are having on the world. To that end, we've rebuilt Measure Map as an integrated feature of both Google Analytics and Blogger. We hope you like what you see." Though we usually don't widely announce private-beta programs, we are migrating all existing Measure Map users (which include many prominent bloggers) to this new interface. With all the excitement around it, we knew we couldn't keep it a secret, so we decided to let the cat out of the bag early. However, please keep in mind that this is an early beta; as such, we expect changes and hiccups along the way. We'll be refining the new interface throughout the year before we release it to the general public as an optional reporting interface in both Blogger and Google Analytics accounts. In the meantime, you can always use Google Analytics to track your blog.